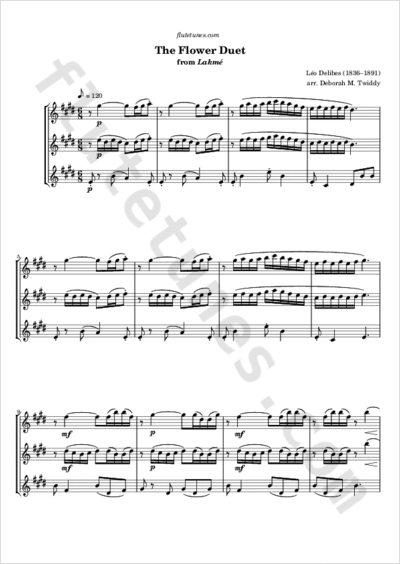 This arrangement for three flutes of the famous Flower Duet by Delibes was kindly contributed to our collection by Deborah Twiddy. The duet originally takes place in Act I of Léo Delibes's opera Lakmé, first performed in Paris in 1883. It is sung by Lakmé (soprano), the daughter of a Brahmin priest, and her servant Mallika (mezzo-soprano), as they go to gather flowers by a river.